After averaging less than 1.5 per cent in each of the last two years, the national average for wage settlements is finally moving up. 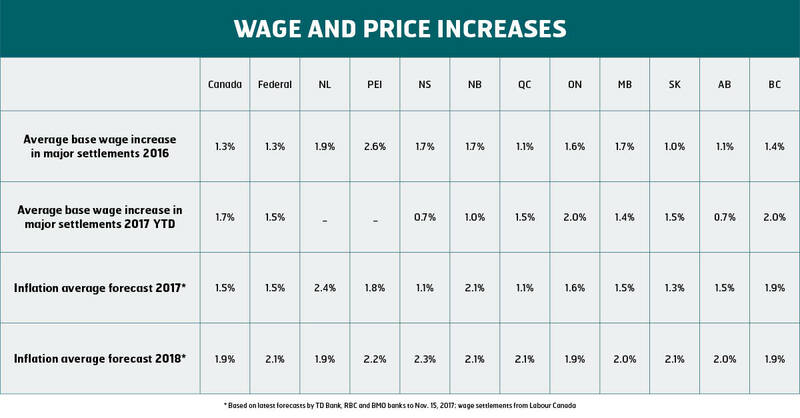 Base wage adjustments settled in the first nine months of this year include yearly average increases of 1.7 per cent over the life of collective agreements, up from 1.3 per cent in 2016 and just 1.2 per cent in 2015. While wage adjustments have trended down in provinces dealing with resource revenue declines and in provinces where governments are forcing wage freezes and constraints, including Nova Scotia, Manitoba and Saskatchewan, wage increases are finally trending up for workers in Ontario, Quebec and British Columbia. If these trends continue, 2017 will be the first year since 2009 that Ontario and BC workers achieve wage adjustments averaging two per cent or more. The average wage increase for public sector workers so far this year mirrored the national average of 1.7 per cent, while increases for private sector workers averaged two per cent. Average wage adjustments are higher this year than in 2016 for every sector except construction. In key CUPE sectors like education, health and social services, public administration, utilities, transportation and information and culture, there’s been a distinct upward trend in average settlements, although this varies by region.